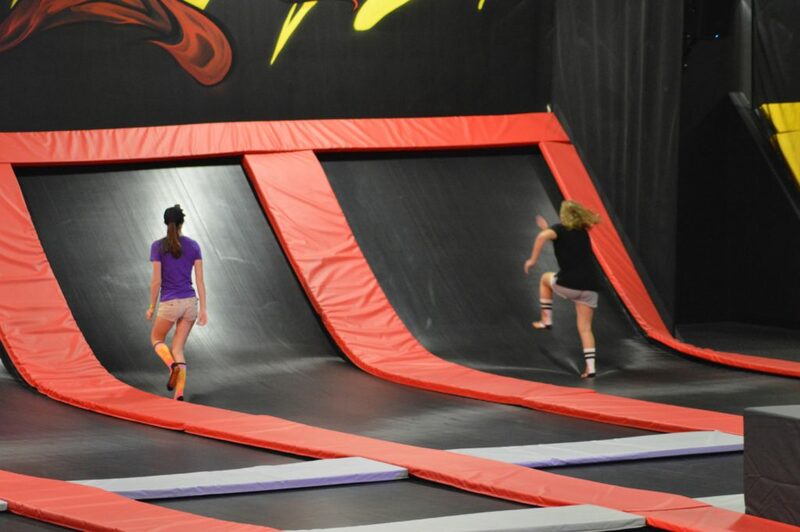 Most of us have probably heard of local places to go and have fun on trampolines. 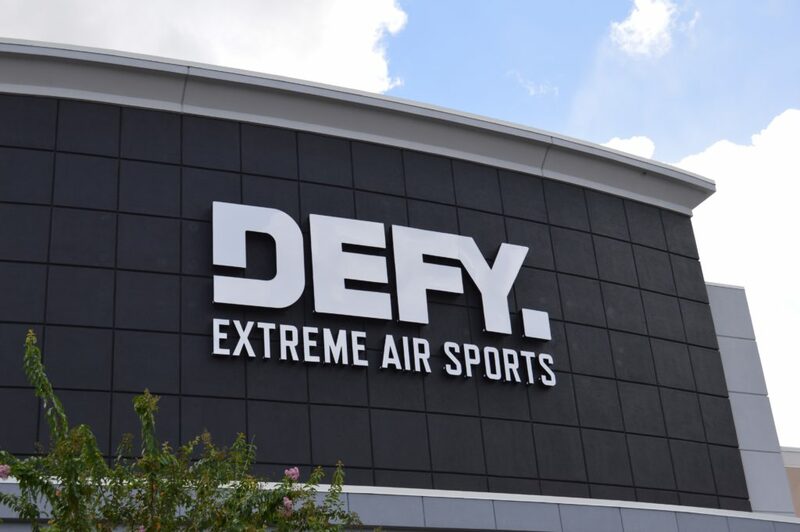 Defy Orlando is that, and SO much more!! Think along the lines of Ninja Warrior competition. 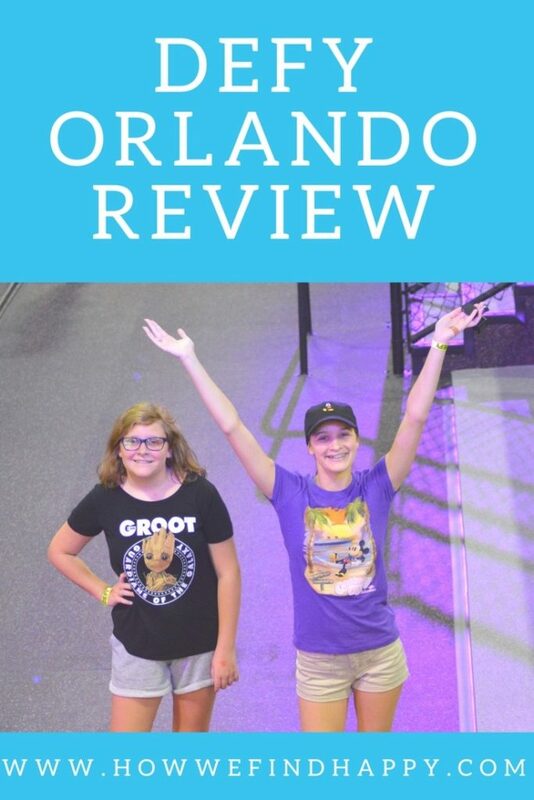 Whether you are local to Central Florida, or visiting on vacation, this is one fun place to visit!! Opening in Ocoee early August, we took advantage of the homeschool rates once school went back. It was organized with our homeschool coop group. 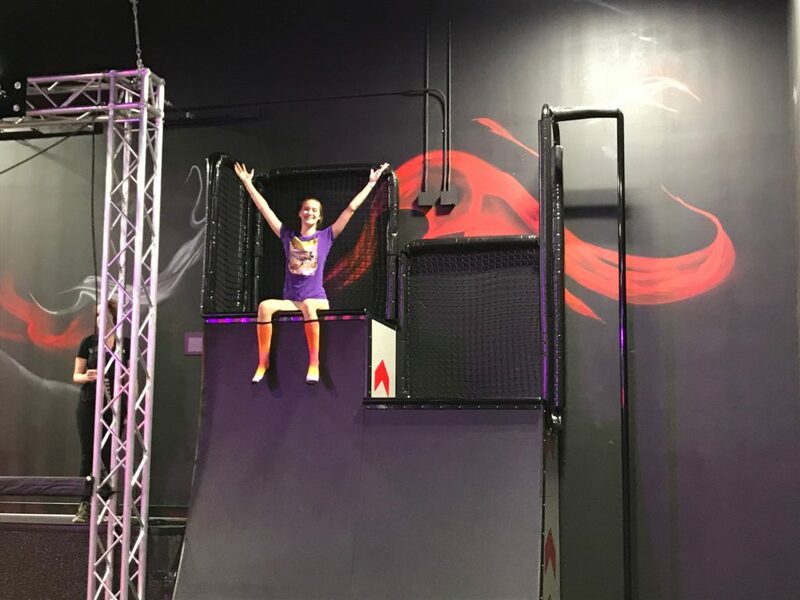 Our girls have not had much exposure with these types of obstacle adventure opportunities, but they had a blast checking out all the different areas. Be prepared to purchase their special skid free socks. We brought some from another trampoline place, but they informed us theirs were made specifically for them, and tested for safety. 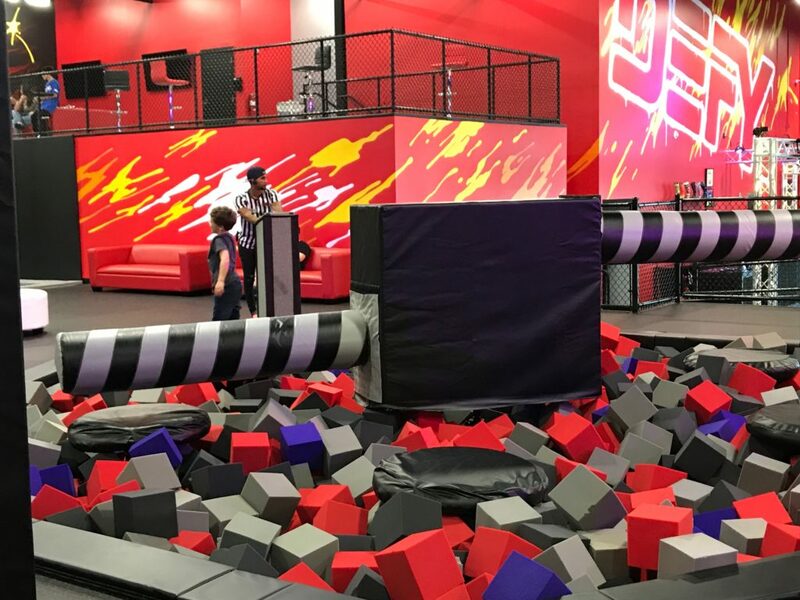 There are plenty of cube foam pits with jumping areas that include platforms, ramps, swings and even a trapeze bar to swing from and let go of, into the pit. Jojo loved the swings!! 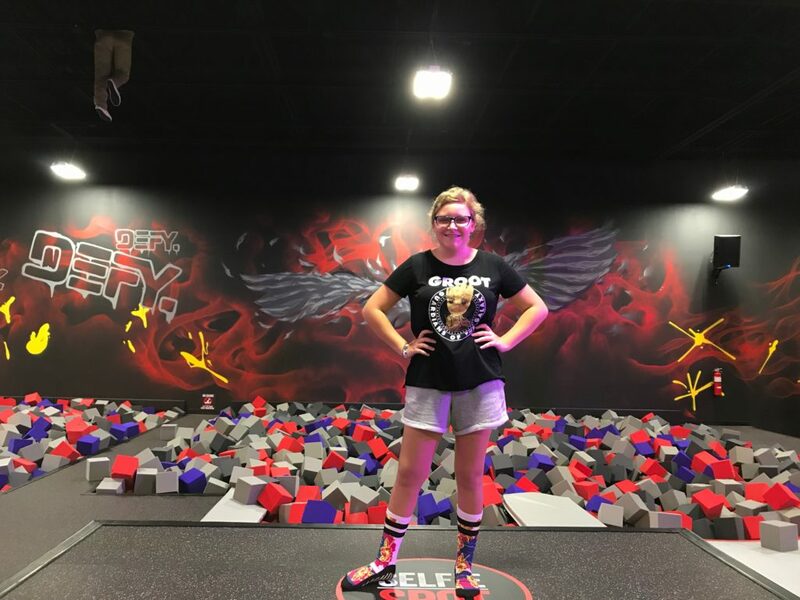 Plus trampolines next to foam pits to bounce into, both were on Anna’s list of favorites!! I call this trampoline road. Lots of connected trampolines and even ones that go up the wall!! These were some tough trampolines Anna tried. The workers were showing the kids how bounce on their back, then touch their feet to the wall (kind of like standing up), then down on their back again. You can see Anna trying it in the video. It’s tough. Our friends’ kids spent lots of time on these platforms with the spinning bars. A worker would control the speed, so it was mixed up. The kids had to either jump over or duck under as the bars came around. This one brings lots of laughs!! 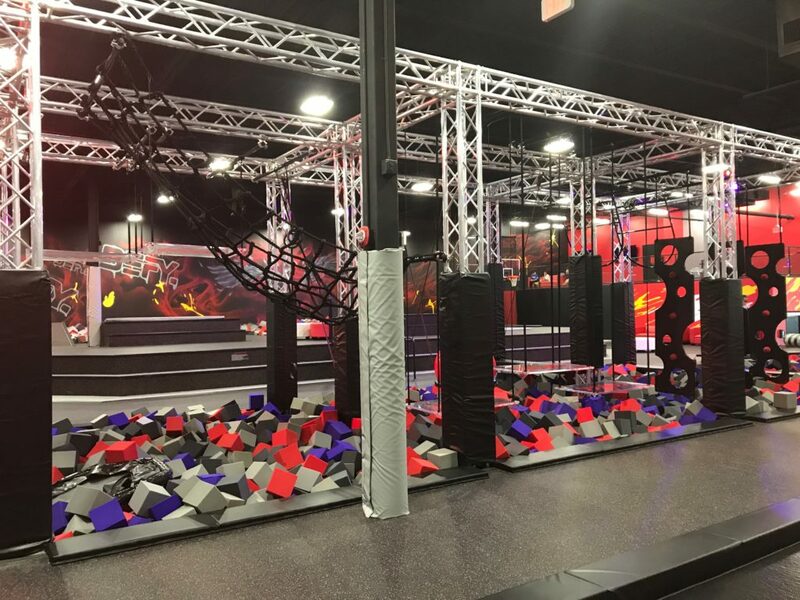 Check out this ninja warrior obstacle area!! The kids were all challenging and encouraging each other to push themselves to the next area. Add this on the list of Jojo’s favorites!! 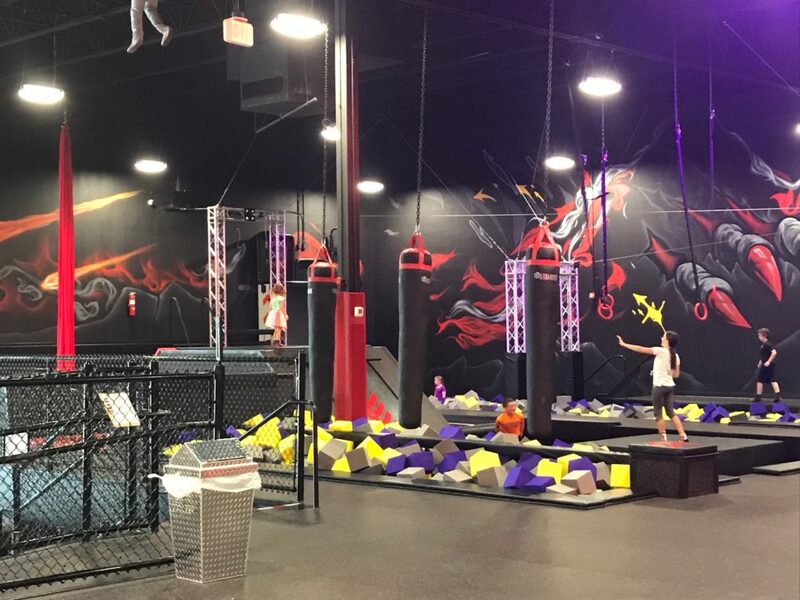 There’s another great obstacle area with pits to jump and swing over with arial silks or rings, small walls to climb over, balance beams, and swinging boxing bags to avoid. Next to that is the larger walls you run up. Anna conquered it the first try!! She was so proud of herself and this was her favorite!! Like basketball? How about shooting some hoops while jumping on trampolines?? Defy even has a fun selfie spot to get your wing photos!! 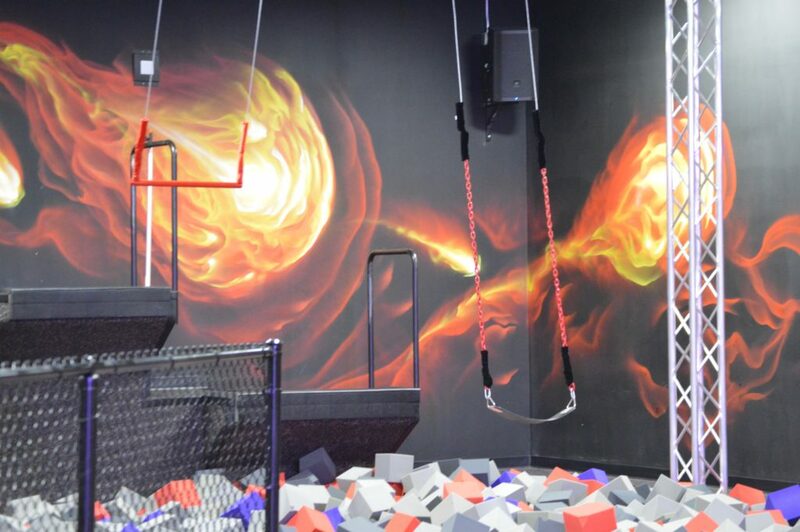 Another tough area is the arial silks, tight rope, and a padded round beam to cross that SPINS!! Yes, it spins when you are walking across it!! The girls got to compete with each other on the balance beam, while using long padded punch pads to knock each other off too. Although they didn’t get too rough. Not this time anyways. They have several seating areas for observers, parents, chaperones. The elevated one is great for having a better eye on several children, especially younger ones. 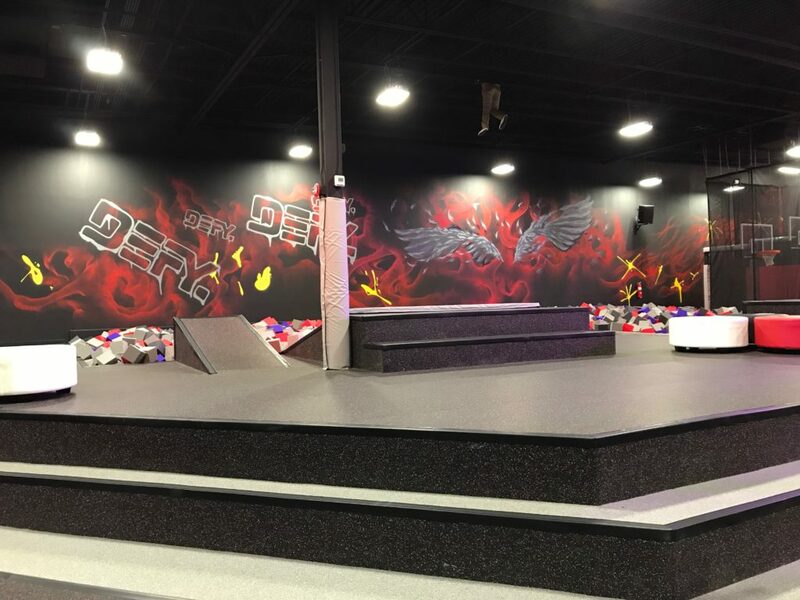 If you travel to the Central Florida area and are looking for some non-theme park fun, DEFY is a great place!! Especially to take a break from the summer heat. We already cannot wait to go back, and take more friends. Especially me, since I could not participate this time. 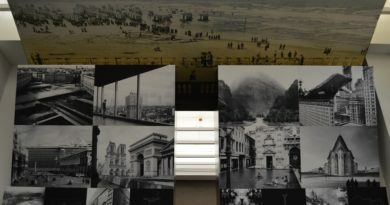 We would love to hear about more places like this. Please share them with us on Instagram!! Looks like fun! 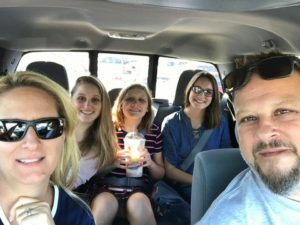 Let us know when you go next time! We will definitely plan on it!! This looks like a bouncy good time!!! It sure was!! hoping to participate next time!! 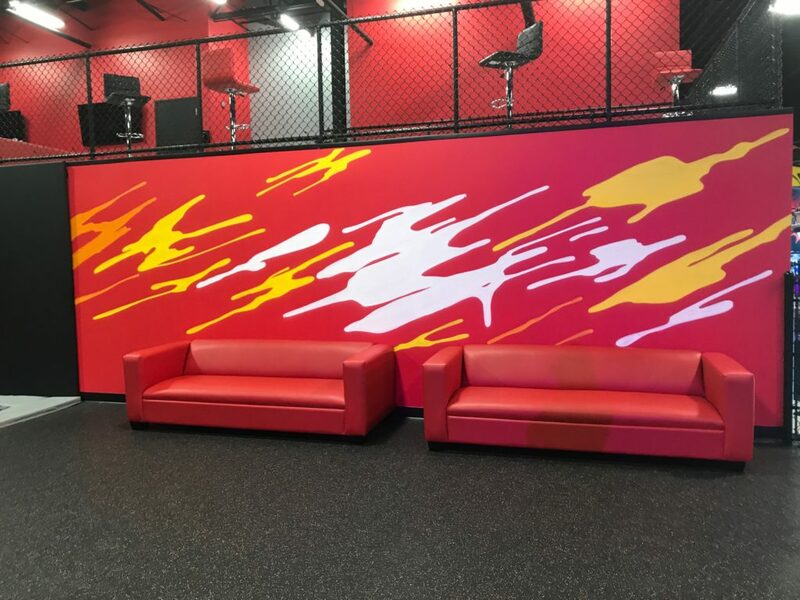 Wow, the kids would love this place! I can’t imagine any kid that would not!! So much to do! We have a similar place in my town and my kids love it. I tried it once and it was lots of fun but I was pretty sore the next day! Always happens to me too. Not as young as I used to be, but my head tells me otherwise!! 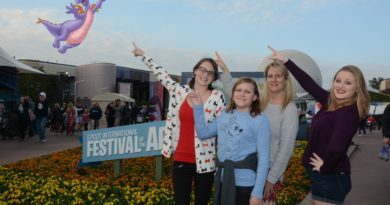 The kids can’t wait to take their friends and go again!! Cube foam pits are the best! I enjoy places where I can try new skills like swinging upside down to another swing and not worry too much about getting hurt. Yep, as we grow older, safety becomes more important, LOL!! I love the workout you get at these places. Fun socks! And you work muscles you forgot you even had!! We just got a Defy in Indianapolis and my son has been asking to go! Looks like I’ll have to take him – this looks like fun! I’ve seen they are popping up in several places. Definitely take him!! He will love it!! 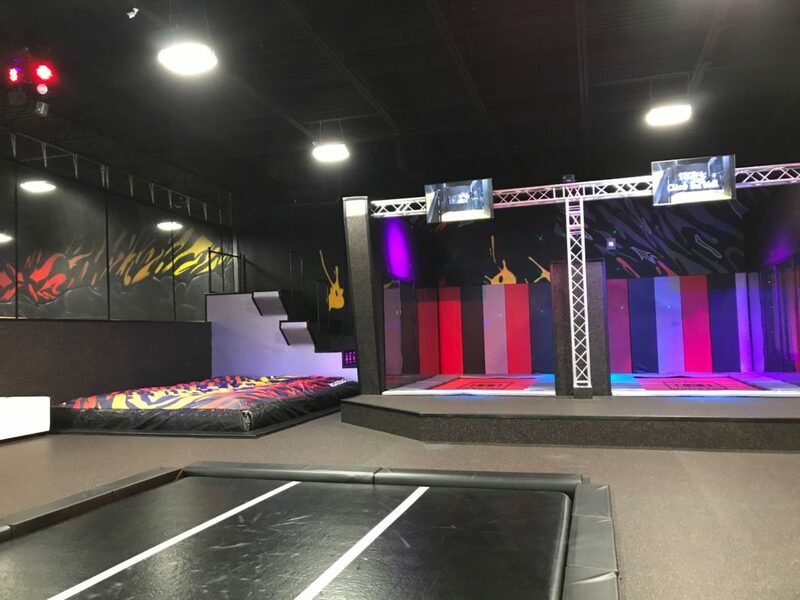 Our local trampoline place needs to step it up! This looks amazing! Yes!! The obstacles were the best part!! Perfect for our rainy days here in Florida!! I’ve never been to a trampoline park. It looks like lots of fun! Definitely something to keep in mind for when my little one is a bit older. 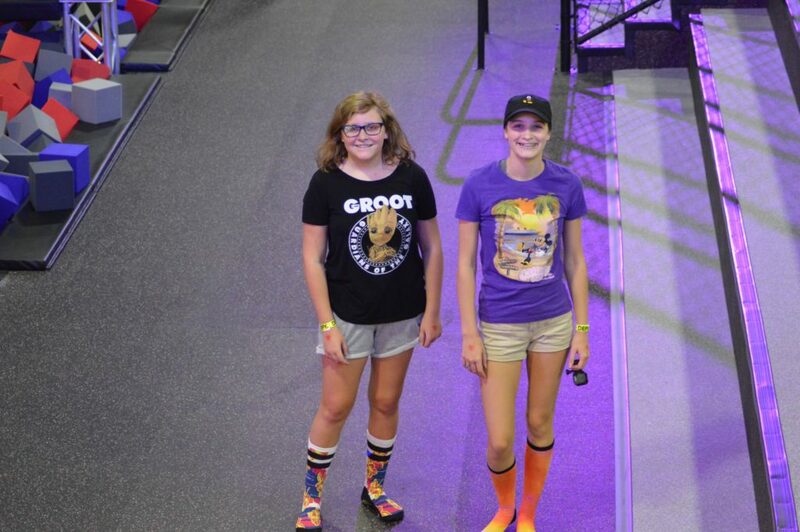 Trampoline parks are fun, but the obstacle courses are even better!! What an incredible place! I’ll try to remember a place like this when my kids ARE bouncing off the walls! Thanks for sharing! Oh, if I was just decade or two younger, I would be trying this for sure. I’ll pass this along to the younger members of my family because it looks so fun!! I watch and wonder how people can do some of these tricks!! My teens would love this. We have a Sky Zone near us, but nothing like this. On second thought, I think I would love this! 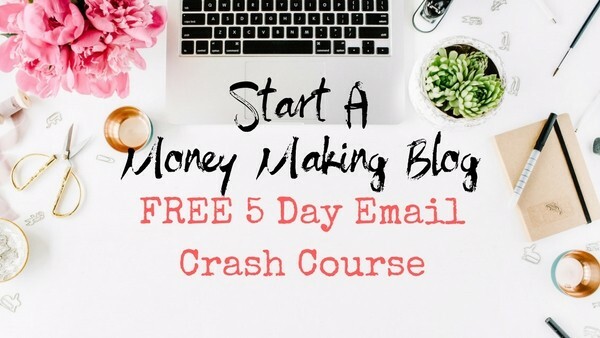 This is so different, you will love it for sure!! Our kids I would absolutely love this, thank you for sharing! This looks like so much fun for older kids! Do they have an area for toddlers and preschoolers? How fun! I know 20 second graders that would run everywhere here! Great winter/rainy/hot day activity. This is not too far from me – I’ll have to check this out for the boys! Thanks for sharing!